When you're a kid, making friends is one of the easiest things you can do. Walk up to someone roughly the same height, say "Hey, wanna be best friends?" and congratulate yourself on another buddy in the bag. Try that line as an adult and the reactions will range from a bizarre stare, to a quick 911 call. It can be tough making new friends, and most of the time the people we meet at work are our best shot. However, because you're in a professional environment and need to see these people every day, you want to keep a respectful distance, at least at first, until you get to know them well enough. 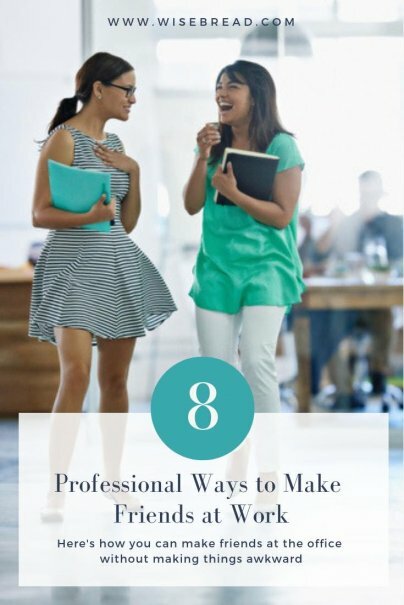 Here are some ideas on how you can make friends at the office without making things awkward. Some work events will be company-sponsored; others will be arranged by colleagues who want to hang out after work. If you avoid these chances at more relaxed socializing with coworkers, you're denying yourself the opportunity to make a real connection. So attend the company picnic, the pot-lucks, the team-building outing to a local axe-throwing club, and of course, happy hour. Most company employees like to hang out after work for a few adult beverages, chewing the fat and relaxing after the rigors of the day. Join in. Make it a point to eat lunch with people you like, as a group, at least a few times a week. If you can afford it, heading to the local lunchtime eatery is another fun way to make friends. Plus, as you're not in the office setting, it can be more relaxed. Breakfast doesn't have to be an expensive gesture. A box of donuts costs about $10, and most people will love the thought and effort you put into it. You could also arrange a schedule, so that a group of you are alternating breakfast duties throughout the month. Even if you're extremely busy, there's always time for a five-minute break to eat a donut and have a coffee. The biggest social network for business is LinkedIn, and it's usually easy to track down your coworkers and connect with them on that site. You can leave messages, or post shout-outs to team members who did a stellar job during the week. If you're new to the company, this is a great way to get closer to people you see as potential friends. They know the ins and outs, and they will be more than happy to help the green employee. By asking for help on a project or task, you show a more vulnerable side, and when egos are small, big friendships can grow. If you're shy and lack self-esteem, you'll struggle to make meaningful friendships. Relax. Think about all of your good qualities. What makes you great at your job? What makes you a great friend? Pump yourself up, and it will really help you make connections. If you have the ability to do so, turn your workspace into an advertisement about your interests and hobbies. If you're the world's biggest Harry Potter fan, celebrate Hogwarts with some desk toys. Love football? Drape the team colors. Can't wait to go paintballing? Put up some event posters and photos of you in your gear. And if there's a like mind in the office, they'll hear about your interests and seek you out.